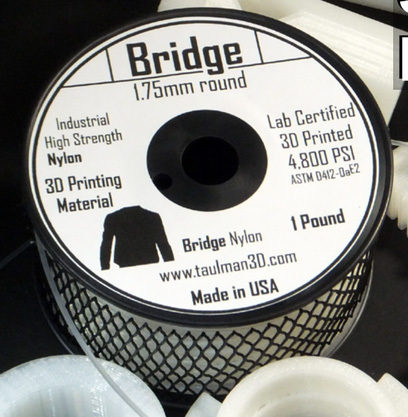 taulman3D is today releasing a new high strength Nylon co-polymer to testers around the world for review. The new material is named "Bridge" as it is a consolidated effort by thousands of nylon 618 and nylon 645 users along with the help and support of both our extrusion house and chemical company. 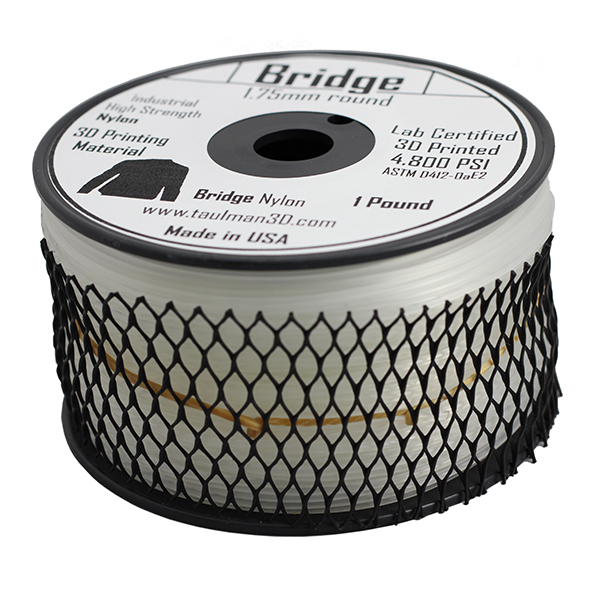 Dubbed "Bridge" by our local St Louis testers as bridging the strength of nylon 645 together with the price of current ABS and PLA thermoplastics, allows any user the flexibility to determine the best choice in material for their printing needs. A Lab certified measure of tensile strength. Better Adherence to the Printing platform. Starting with our strongest base polymer used for a percentage of nylon 645, we began working all of these requests. First, was the adherence to the Printing platform. Those that follow the use of nylon in posts, blogs and 3DP discussion rooms know of using garolite (LE) as a print surface. While this works well for all of taulman3D nylons, garolite is not always easy to acquire and even so, requires a properly cut section that fits each user's unit. Our thanks goes out to our chemical company for helping to change this requirement. The surface properties of most nylons is extremely slippery making adherence to the printing platform difficult. Our chemical company was able to make minor adjustments, to reduce the surface effect just slightly, thus allowing for the use of most PVA glues, either full strength or diluted. Initial testing shows that in some cases, the PVA was better with Bridge than garolite is with 618. Thus, some dilution was used. The specific PVA used in our labs is a very low cost "ELMER'S Glue-All" White PVA. Next was Reduced water up-take from local humidity. While it is not possible to eliminate the water uptake by nylon, it is possible to localize it to the surface through final processing changes. Therefore when printing, rather than water creating a subtle popping that can effect the surface finish, Bridge will hold the water to the outer portion resulting in a slight steam when wet. The result of this is that Bridge needs little or no drying in the winter and just needs to be warmed in the summer months. This is a manufacturing process that our extrusion house developed and added to our existing taulman3D processes. We found that the same process that reduces water uptake also helps to reduce shrinkage. While nylon will always have a slightly higher amount than ABS, we were able to reduce it to an in/in value less than our current nylons. These changes also led to a slight reduction in stringing as the extruded threads are a thicker melt. Non-destructive evaluation of 3D Printed parts is a function of the transparency of Bridge. Like nylon 645, this transparency allows for visual inspection of printed parts. This is a combined request from our industrial and clinical customers. As noted early on, parts can be printed "too fast" for some polymers. While the outside of the part may look acceptable, a part printed too fast will not have internal fill material that actually adheres to the inside of the perimeter. With Bridge and nylon 645, Non-destructive evaluation is a simple visual verification. With this combination of advancements, taulman3D proceeded with a limited test run. From this initial test run, we printed test samples to be sent out to the St Louis test labs. A fully accredited testing facility supporting the central US. The lab reported a Tensile Stress PSI of 4,800 for Bridge when 3D printed. taulman3D supports several industrial, commercial and clinical customers with nylon 645 and this has allowed us to meet all of our pricing tiers for certain chemicals used in 645. Because 'Bridge" is a very close chemical polymer to nylon 645, we are able meet these pricing requests. Daniel Norée ,Author of OpenRC, Designer, Maker, Presenter, destroyer of small parts!